St Mary has a unique importance and role in the line of saints venerated by the Christian churches. She is the one who borne the God when He took flesh. While Mary was betrothed to Joseph, an angel visited her and told her that Holy Spirit would come on her, she would become pregnant and give birth to a child who will be called ‘the Son of God’. Though this announcement caused great awe to the young virgin, she submitted herself to the will of God by saying ‘I’m the Lord’s servant. May it happen to me as you have said”. Despite being the Mother of God, Mary’s life was not a bed of roses. It’s possible to imagine the humiliation she might have faced from the society for giving birth to a child without a marital relationship. She had to gone through severe painful experiences as she witnessed the sufferings of her son. Before dying on the cross, Jesus told to St John, the Apostle “here’s your mother” (St John 19:27) and thus gave the responsibility of taking care of her to him. The Church regard this as a command to the Church and respect St Mary as the first among saints. (A point to be noted in this regard is that the Church DOESN’T worship St Mary or pray to her; instead the Church seeks her intercession and prays FOR her. God is the only one to be worshipped). In the orthodox tradition, St Mary is termed as Theotokos (Mother of God) because the scripture says Mary borne and gave birth to the God. In the fifth century Arius propagated a schism in the church. 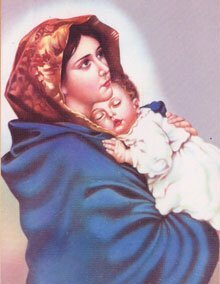 He taught that St Mary should not be called Theotokos because she didn’t give birth to the God, instead a normal child (whose name was Christ) who became God later. So Arius argued that she could only be called Christotokos (Mother of Christ). The Synod of Ephesus declared Arius as a heretic and reinforced the term Theotokos.